Published 8th February 2019 at 239 × 400 in Dogs Looking for Homes. 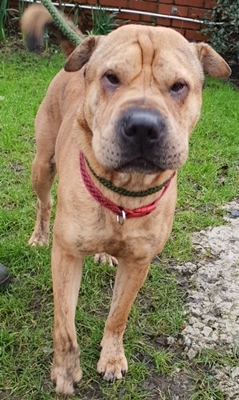 GONE TO RESCUE (Wonky Pets) ‘Pickle’ Approximately 3 year old Shar-Pei, castrated male. Pickle was a stray so his background is unknown. We have found him to show kennel-guarding behaviour but has behaved when out of the kennel and let the vet examine him without any issues. However, we feel he should not be homed with children and needs an owner with experience of dogs with this behaviour.